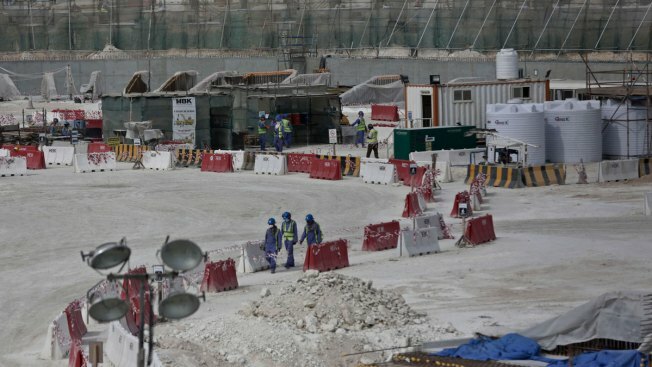 In this May 4, 2015, file photo taken during a government organized media tour, foreign workers walk between safety barricades at the site of the pitch of the Al-Wakra Stadium that is under construction for the 2022 World Cup in Doha, Qatar. Migrant laborers faced abuse that in some cases amounted to forced labor while working on a stadium that will host soccer matches for the 2022 World Cup in Qatar, a new report released by Amnesty International alleged Thursday, March 31, 2016. Amnesty International slammed the Qatari government Wednesday for its alleged abuse of migrant workers building stadiums for the 2022 World Cup, NBC News reported. In a 52-page report, Amnesty said every one of the 231 construction and landscaping owners it interviewed reported some form of abuse including bad living conditions, lower pay than originally promised and threats to silence complainants. Most of the workers are from Bangladesh, India and Nepal. The group also called in major sponsors like Coca-Cola and McDonald’s to pressure FIFA, the organization that runs world soccer, to clean things up.